Big, bold, beautiful – these are all words that have been used to describe the Garmin Fenix 3. This GPS watch is packed with features, including new activity tracking abilities, new apps to connect and explore, and a beautiful new display screen. Armed with amazing battery life and the option for a super strong sapphire glass screen, the Garmin Fenix 3 is a strong choice for athletes who wish to take their outdoor training to the next level. NEW Bold Design: Uncompromising construction quality such as a stainless steel bezel and scratch-resistant domed mineral glass lens. NEW GPS + Glonass: GPS+GLONASS for faster fix and higher accuracy in demanding environment. NEW Exo Antenna: Omni-directional steel GPS/GLONASS antenna on surface of watch. NEW Sapphire Lens: High-strength scratch resistant domed sapphire lens (Sapphire version only). NEW Chroma Display: 1.2” sunlight-readable, high-resolution, brilliant, colour Chroma display. NEW Wireless Connectivity: Utilize Wi-Fi hot spots to automatically sync data to Garmin Connect and to update device software. NEW Connect IQ App: Customize your watch face, add widgets, data fields, new activities and more. NEW Activity Tracking: Use as activity tracker (step counting, calories, distance throughout the day,stay active with move bar, track sleep). NEW Water Rating: Water rated up to 100 meters; suitable for swimming. Battery Life: Rechargeable; up-to 20 hrs GPS mode, up-to 50h UltraTrac GPS mode, and 6 weeks in watch mode (depends on settings). ABC Sensors with Autocalibration: Barometric altimeter (elevation and barometric pressure) and 3-axis electronic compass with auto calibration (GPS). Fitness Training: Real-time performance data such as time, distance, pace, calories, speed, lap data, and heart rate. Running Dynamics: When paired with HRM-Run monitor: Gives feedback on cadence, vertical oscillation, and ground contact time. Navigation: Garmin quality navigation and tracking functionalities clear guidance on map page find always the safe way back thanks to TracBack navigation. Triathlon / Multisport: Full-featured including Running Dynamics, VO2 Max and Power Meter reading for cycling, Swim Metrics for both open and pool training. Ski / Board Mode: Measures 3D speed, distance, time, runs, auto run detection and features ski specific data pages, history of runs and performance data. Swim Mode: Indoor/outdoor swim modes that record distance, pace and time. For pool swimming, also detects stroke type, and computes the user's SWOLF score. In practice, this probably means charging the watch once every week or two for athletes who are using the watch to train daily. This is very reasonable for such an advanced fitness watch, and you won’t find many similar watches with better battery life on the market. The clip-on charging frame connects to a USB adapter for convenient charging. The Fenix 3 is a big watch; there’s simply no getting around it. With dimensions of 1.2" x 1.2" x 0.6", this watch is quite bulky and can feel very noticeable on your wrist. For this reason, it may feel uncomfortable to wear at all times, especially while sleeping – which makes the sleep tracking feature feel fairly useless. While this watch is advertised as suitable for both genders, the size and bulk of this GPS watch make it feel more like a "mens" watch - many women simply may not find it stylish enough to comfortably match daily attire. With all of the features of the Fenix 3 in mind, you’re probably not expecting it to come cheap – and you’d be right about that. 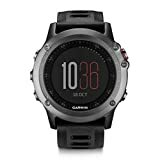 The watch is available for purchase directly from Garmin, as well as through retailer websites like Amazon (where discounts can sometimes be found). You can expect to pay several hundred dollars for the watch. However, it should be noted that this watch is becoming a dated model, having been released in 2015; this means you may be able to find good sales or more affordable refurbished options (Amazon). While the Fenix 3 costs a pretty penny, for the serious athlete it is absolutely worth the price. This watch should last many years, especially if you opt for the tougher sapphire glass version. With the Fenix 3 you’re getting many of the features of a standard smartwatch combined with excellent fitness tracking and GPS navigation. For those looking to improve training and performance, a product such as this one is quite invaluable. While this watch won’t come cheap, discounts﻿ can be found through sales or online retailers like Amazon - especially since the Fenix 3 isn’t the newest model on the market. All in all, the features offered by the Fenix 3 make it well worth the money, especially for those who are serious about training and expect to use the watch for many years. Garmin Fenix 3 GPS sport watch for demanding athletes and outdoor adventurers. Fenix 3 is powered by advanced GPS/GLONASS positioning via the new steel EXO antenna. It comes packed with multi-sport training functions, new trail running features and extensive navigation. The watch comes with athletic, rugged design and a high quality build and it is also smart: it supports LiveTrack, Smart Notifications and Connect IQ Apps for further customization.